Moving to and from the bike is part of the ride. Cleatskins Bikeskins provide traction, comfort and ease of movement without heel-walking. 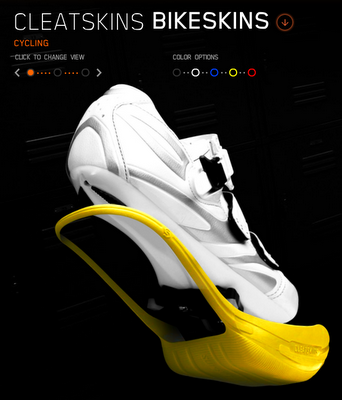 It's the perfect bike cleat protector for you, your cycling shoes and the surface you walk on. Cleatskins Bikeskins are avaikable in a wide array of colors including: Yellow, True Blue, Black, White, and Red. Perfect for all cycling cleats, including Look, Shimano, Speedplay, Time, etc. Bicycles are displayed in backlit boxes at this Barcelona bike store designed by architect Joan Sandoval. Called Pave, the store includes a library where shoppers can drink coffee and read magazines on cycling, lounge where they can watch important races on TV and showers where they can refresh after training. The ride will leave promptly at NOON so please be at the park by 11:45AM. Mileage from Goodale to the trucks and back is roughly 20 miles. I will be riding a cruiser bike so the pace will not be fast. Hal & Al's is providing beer merchandise for the raffle. We will offer $1 tickets and are asking for a $5 voluntary donation for the ride and you will get 5 tickets for the donation. All proceeds will go to Yay Bikes! The raffle will be drawn at Hal & Al's after the event. 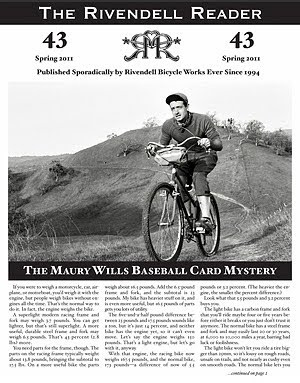 Don't forget Pinchflat: A Bike Poster Blowout! opens TODAY! The CrossRack system allows you to mount a standard bicycle bag to almost any bicycle. 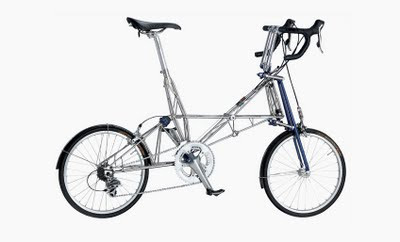 Your cargo is centered on your bike and mounted in your slipstream to reduce wind resistance. The CrossRack system takes advantage of the ample space right behind you, especially on bicycles with small wheels, and puts your bag just where you want it. The CrossRack system is the result of more than three years of testing and refinement by our engineers who commute by bicycle and who sought the best everyday cargo solution. Mounts to most bicycles and scooters. Centers load for best balance. Positions cargo in slipstream of rider for low drag. Works with most standard bicycle panniers. Detaches in 5 seconds via locking pin. Rack "horns"can hang many standard bags, including plastic shopping bags. Fits post diameters from 1.0 - 1.4 inches (25 - 35 mm). Ohio Fun Fact: Unicycling is a mandatory subject at St. Helen's School in Newbury, Ohio. 500 hours a year - or 2 hours each day - is roughly the equivalent to what the average American worker will work in order to pay for their cars (the average is between 1.46 hour/day and 2.90 hours/day depending on which data is used). A legendary bike company founded by one of the Mini's original engineers unveils a drool-worthy new offering, the Pylon. Joined paceline - Lauren and Kelsey (please comment/contact me to correct) and Kristy and Russ Yonyon towards the end as we came into Columbus. Andy flatted a few miles from Circleville and rode in on a flat. He purchased a new tire/tube. A participant was riding a penny farthing from Columbus to Chillicothe. Started to light rain in Waverly and we geared up, but it held off. We had dinner at Toro Loco Authentic Mexican and it was great. I had the burrito grande which filled a platter big enough to hold a Thanksgiving turkey (see pics). We setup camp at the stadium in the rain, plus a football game was in progress. Four local kids wandered through the parking lot as we were setting up and asked if we were camping. We told them that we were indeed camping. Their response? "That's retarted". Lovely kids in Portsmouth. Once it cleared up we walked into town and visited a few bars. The highlight was the Dickens Pub because of the atmosphere, beer on tap and a live band was playing. Around 1am a thunderstorm blew through and a lightning strike hit within a few hundred feet if not closer to our tents. It rained for at least an hour pretty solid and we woke up to soaked tents. After we broke down camp we headed to Bob Evans for breakfast which ended up being so-so and really slow. Because the service was so slow we didn't make the cutoff point for the rest stops. Tim flatted leaving Portsmouth. Brett was running late from the restaurant and proceeded to pass us as we were fixing Tim's flat. Ray flatted again coming into Chillicothe. It seems as though the tire pinch flatted and blew the tire off the rim. Four riders joined our paceline heading into Columbus. We called our group Team Bob Evans because we realized everybody in the group was subjected to the lousy service and were late getting out of town. 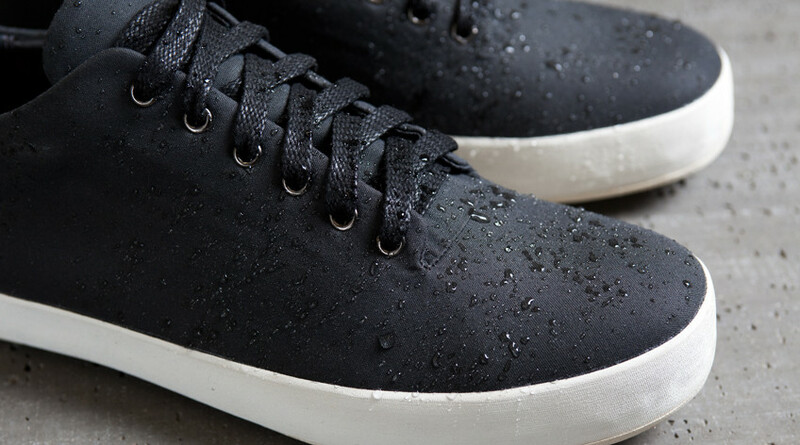 Tough and refined, Outlier's Supermarine shoe is hand-built for foul weather using a World War II technology that still can't be beat.